PCOS Diva teamed up with PCOS Challenge to offer the PCOS Diva/PCOS Challenge Confidence Grant. 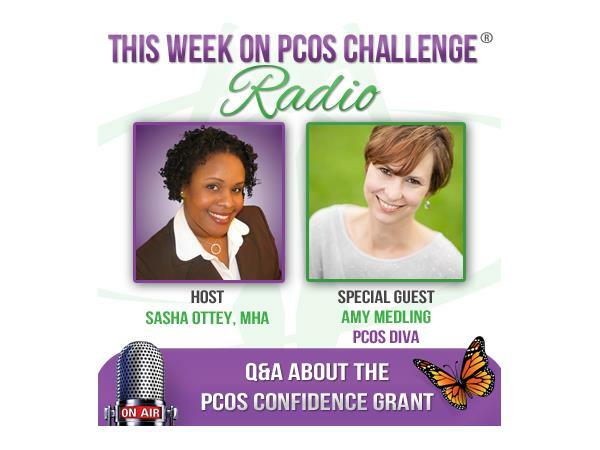 Amy Medling, PCOS Diva founder, joins PCOS Challenge founder, Sasha Ottey, on the PCOS Challenge radio show to discuss the grant and answer your questions. The PCOS Diva/PCOS Challenge Confidence Grant was created to help women and girls struggling with hair and skin issues related to Polycystic Ovary Syndrome. The grants are awarded in amounts up to $500 per individual to assist with the costs associated with dermatology treatments, laser hair removal or electrolysis. Payments are made directly to the provider performing the treatments. This grant was made possible through an endowment by PCOS Diva. Learn more and apply at PCOSChallenge.org/confidence.